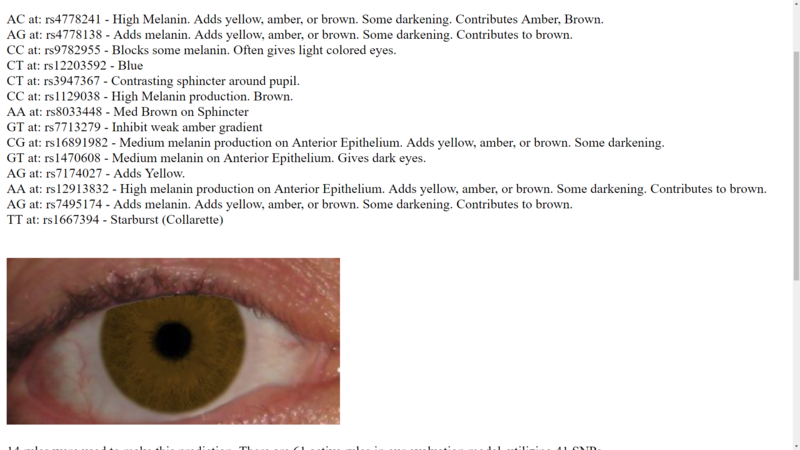 What is your actual eye color ? CC at: rs3794604 - Blocks some melanin. Often gives light colored eyes. GG at: rs7174027 - Blocks some melanin. Often gives light colored eyes. CC at: rs4778241 - Low Melanin. Basis for Gray, Blue, Green, or Yellow Eyes if no other pigmentation is present. CT at: rs3947367 - Contrasting sphincter around pupil. TT at: rs1129038 - Penetrance modifier. Blue. TT at: rs11636232 - Increased density of anterior stroma. Blocks melanin. Blocks blue. Gives lighter colors. CC at: rs4779685 - Flecks (Nevi). His are a similar shade of blue, not quite so light. CC at: rs9782955 - Blocks some melanin. Often gives light colored eyes. CC at: rs7403602 - High density on Anterior Stroma. Blocks melanin. Blocks blue. Gives lighter colors. 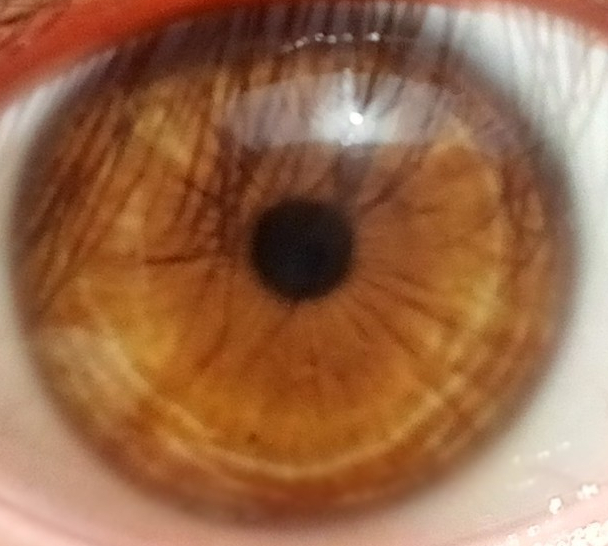 I don't have flecks, and my eyes are basically just plain green, no blue, and a darker line around them. Last edited by PoxVoldius; 05-26-2018 at 11:34 PM. Results are Blue with Starburst green with no outer ring. Mine are Starburst green with blue highlights with darker outer blue ring. Father's eyes brown, mom's blue. Last edited by Sizzles; 07-03-2018 at 11:31 PM. Hi, my eyes are hazel. 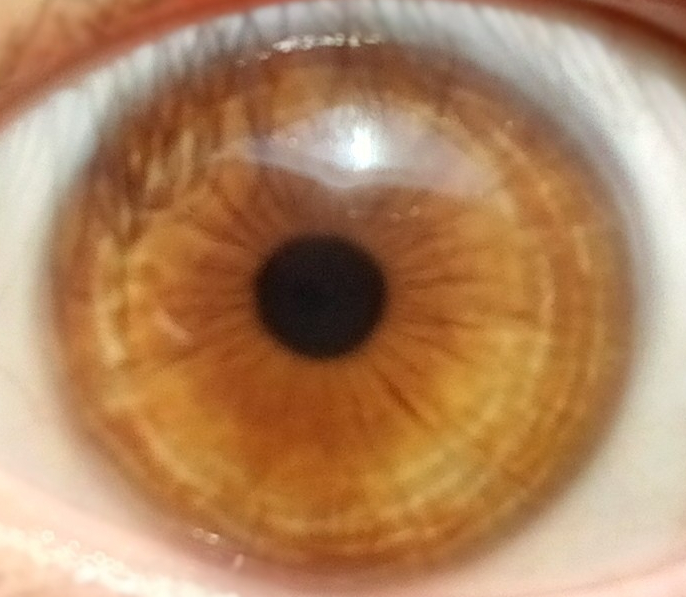 According to 23andMe "your genetics make you most likely to have brown or hazel eyes." Interesting. 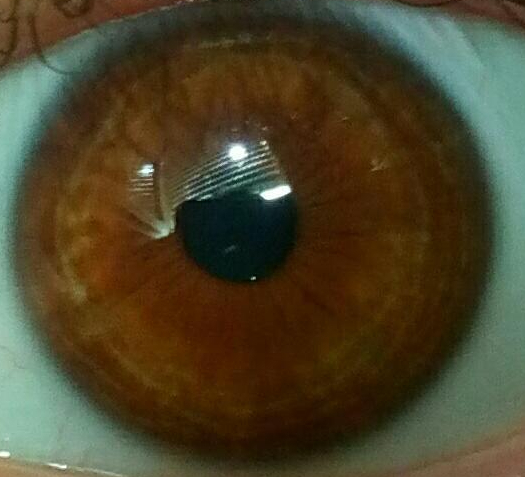 I have dark brown eyes. I don't know how this prediction is possible cause 1% of people are said to have this, but they have predicted correct I have green eye.